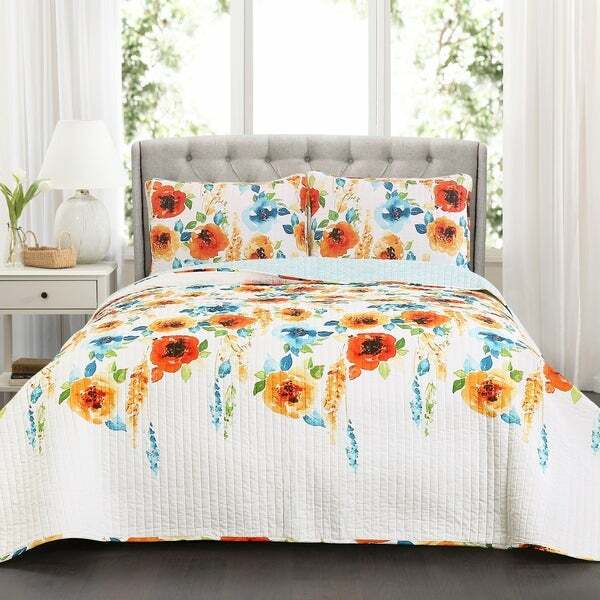 This quilt is beautiful, gives a nice spring feeling with the floral summer colors. It fits my bed perfect and measurements specifications are true to fit. I absolutely love it!!! Beautiful colors. Nice light weight quilt. I love this quilt set. Lush decor has some really great home decor items. I would definitely recommend this set. The colors are vibrant and this is a soft quilt. It looks great on my king size bed. Very pretty vibrant colors in this quilt. Lightweight so good for the summer months. I can’t wait to finish my bedroom and see all of the colors together. Matches my bedroom perfectly. The aqua blue in the bedspread is the same shade as my walls! It is gorgeous with my white furniture. It’s beautiful. Light weight, bold colors and it is the best. Love the colors and the fact that it is washable. Wanted to bring lightness with s pop of color to room. The coverlet is a gift for my mother-in-law. She wanted something that would brighten her room and most important to her, it had to be light weight, this item seems to be exactly what she wants. The reviews were also very favorable. "Is this quilt background a bright white or an off-white?" This quilt features an off-white background. "Is the bright color red or orange in this quilt? "